Fantastic aesthetics and overclocking performance and features at a reasonable high-end price, with almost no flaws to be found. The Sabertooth series of motherboards has been the pillar of innovation within Asus's arsenal since its conception in 2009. It's the playground for their insane concepts, and on top of that, it's a lineup that has time and time again wrenched world-firsts out of the hands of its competitors. A Sabertooth was the first board to introduce the full thermal armour covering (which would later be adapted for RoG's Formula series); it was the first board to introduce full PWM fan control across the entirety of the MoBo with the help of the dedicated ICe onboard cooling processor; it was the first board to include a full internal cover to hide those garish rear I/O connectors; It was the first motherboard series to include extra pins in the X99 socket to improve overclocking stability. I've often referred to the Sabertooth as the workhorse of Asus's extensive motherboard portfolio, and that's a fact that doesn't seem to be changing any time soon. What's new & storage options? With that introduction out of the way, what does Asus TUF’s fifth iteration of Sabertooth bring to the table? Skylake and DDR4 support, for starters. Fortunately Asus has taken a leaf from the X99 Sabertooth's book and included an M.2 x4 socket hidden discreetly under the armour just south of the chipset, meaning super-fast storage speeds of up to 2250 MB/s read and 1650 MB/s write with the latest Samsung 950 Pro. Being able to hide those often ugly green SSD PCBs is a lifesaver for anyone looking to build a clean and sleek rig. In comparison to its Z97 compadre, this Sabertooth features an additional two SATA 6Gbps ports, and finally introduces both USB 3.1 type A and type C in the rear I/O, promising speeds of up to 10Gbps. As far as increasing the performance of those CPU cycles, this board still follows admirably in its predecessors footsteps. It's a phenomenal piece of design. If you're like me and love to do a bit of spontaneous overclocking every now and then, it easily caters to your whim. In our testing we reached a solid 4.85 GHz overclock using Asus’s 5-Way Optimisation software, with little to no problem. The 5-Way Optimisation is an auto-overclocking software solution—it being able to take a core to within 0.5 GHz of its total potential is both terrifying and amazing. Based on luck of the draw, our Skylake CPU is limited to a maximum overclock of 4.95GHz. We're forever stuck below that insurmountable 5 GHz mark. 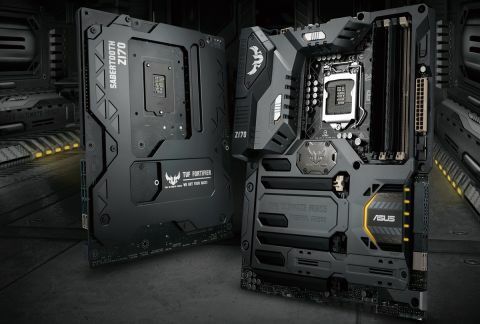 So the fact that the Sabertooth matched our Asus Maximus VIII Extreme testing is astronomical: this board costs £199/$250 (£125/$250 less than the Extreme). After taking hold of the reins and setting to work on the BIOS, we managed a pretty comfortable 4.9 GHz overall with only 1.42V on the CPU voltage. I've tested premium boards with more features than the Sabertooth, and I've tested boards that are solely designed to overclock processors above and beyond anything imaginable, but this is the first time I've ever experienced anything quite like this. For price to performance, this board has no equal, not even in Asus's own back yard. No doubt this is all down to the inclusion of TUF's 10K black metallic capacitors, alloy chokes and military grade MOSFETs. The big question we have here is what, exactly, differentiates these VRMs from those found on the Maximus VIII Extreme? Certainly the caps seem to be the same, but the MOSFETs included on the Sabertooth consume less voltage than those on the Hero or any of the other mobos around this price point. The advantage of this is less heat output and far greater overclock potential without encountering any thermal limitations. Couple that with the phenomenal cooling performance provided thanks to Asus's internal 60mm fans, and you're looking at a winner here. It overclocks like a monster, of that we're certain. For price to performance you're not going to get much better when it comes to CPU crunching cycles, certainly not on the Z170 platform. But I have to address the elephant in the room. For the longest time, Asus's Thermal Armour has been a point of much contention amongst PC enthusiasts and gamers alike. It all revolves around whether the extra cost added from that PCB covering plastic is worth it. Overall, although motherboard temps can sky rocket into the mid 50s occasionally, generally speaking it's not enough to damage any of the major components. Although Asus has attempted to address these worries with the inclusion of two optional assistant fans (one near the rear I/O and one at the centre of the board), it's still debatable whether that's helping performance in any way. The one thing it does give this board is a phenomenal amount of grace. The black and grey styled cover is sturdy, and although it isn't anywhere near as strong as the TUF Fortifier reinforcing the back of the motherboard, it still adds an air of premium to the whole situation. It's nice to see Asus finally step away from the camo design they've been integrating into these things since time immemorial as well. Unfortunately we still have to put up with beige on every other port, but if you're a little intuitive with your positioning of dust defenders and your hardware, it's not too difficult to hide those away either. As far as cooling support goes, you're all covered. You can connect up to 11 PWM fans to this bad boy, couple that with Asus's shiny Q-Fan control, dedicated water pump header and auto-tuning and before you know it you'll have a super cool, super efficient, super quiet system. For price to performance you're not going to get much better. All of Asus's motherboards come with a plethora of software packages, and the Sabertooth is no exception. You still get AI Tweak III, Asus's Home Cloud solution and a bunch of other ease of life programs on top of that. If you're looking to tweak your overclocks and fan settings from desktop, it's a painless process. AI Tweak has been through a hell of a lot of revisions since its first conception and the UI is fantastic. There's one other feature worth mentioning at this point, and it's something that's been pulled across from this Z170's X99 twin. That's TUF Detective. One of the few criticisms we have for this motherboard is that, given its price point, it lacks any sign of an onboard post-code display. Admittedly there are 5 LED indicators just south of the chipset that can indicate any potential problems with your components, but they just don't provide the same level of detail that a post-code display can provide. That's where the TUF Detective II comes in. There's a single USB 2.0 port located at the rear of the motherboard, and if you attach a USB to micro USB cable from that port direct into any Android device, there’s an app to help you out. You get a whole plethora of additional features, including post-code readout, fan speeds, temperature management and overall system specs as well. In short, it's a fancy little feature for diagnosing any problems on the board that you otherwise can't solve from the aforementioned five little blinkers. The short answer is: Yes. If you've got the money to spend, and are fishing around for the latest motherboard and CPU combo, this mobo is a sure-fire bet. It'll provide you with enough performance to easily last another three to four generations of CPUs for sure. As motherboards go the Sabertooth has a phenomenal feature set for its price point, its performance is second to none and it just looks stunning. With a five year warranty on top of that? Well that's enough said, really. As far as downsides go, the only ones I can think of revolve around the lack of a post-code display, no onboard power buttons and the fact that we still have to put up with that god awful beige every now and then. But other than that she's a beauty, and definitely worthy of our Editor's Choice award. All benchmarks are performed using an Intel Core i7-6700K, 16GB of DDR4 @2400 Mhz, an Nvidia Geforce GTX 980, and a 500GB Samsung 850 Evo.